Russia condemns the increased deployment of foreign offensive weapons systems near North Korean borders, Russian Deputy Ambassador to United Nations Vladimir Safronkov said Wednesday. UNITED NATIONS (Sputnik) — Earlier in the day, the UN Security Council unanimously adopted resolution 2321 imposing new sanctions on North Korea following its nuclear test in September and missile launches. The resolution prohibits UN members from buying North Korean coal, iron and iron ore, as well as nickel, copper, silver, zinc and monuments. 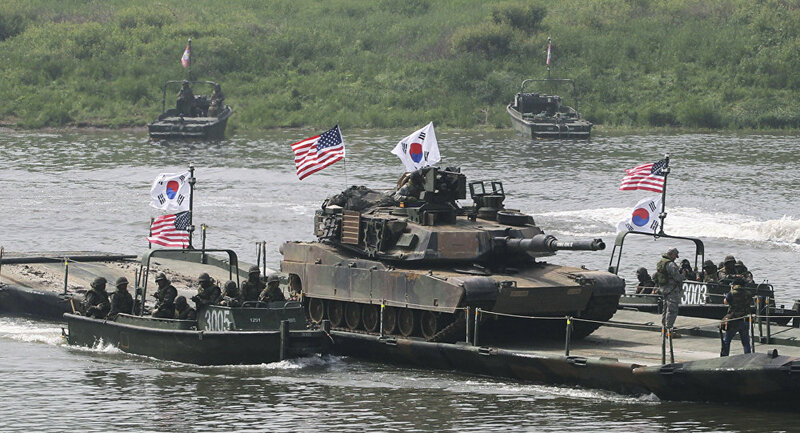 "The situation on the Korean peninsula should not serve as a pretext for increasing foreign military presence in the region. We strongly condemn the buildup of offensive weapons near the borders of North Korean neighbors, including THAAD [Terminal High Altitude Area Defense] anti-ballistic missile systems," Safronkov said after the vote. Security Council sanctions do not aim to preclude further talks with North Korea, he added, stressing that the resolution cannot be used to harm the North Korean economy or worsen the humanitarian condition of its population. The UN Security Council adopted the first resolution on North Korea in 1993. In 2016, the Council held nine emergency consultations in response to Pyongyang’s nuclear test and ballistic missile launches. This year the country conducted two nuclear tests and at least 25 launches using ballistic missile technology. In July, South Korea and the United States announced they had agreed to deploy the THAAD system in South Korea's Seongju County. The system is designed to intercept short, medium and intermediate ballistic missiles at the terminal incoming stage.